11 Plaza Carlota is a spacious and new ground-level flat that can accommodate 6 adults or one to two families. A unique feature is the large, private shower in the charming foyer, a perfect place to rinse off beach sand before entering the living area. The home’s wrap-around terrace, which overlooks the spectacular gardens of Plaza Lucia, has a splash pool and two sets of lounge furniture, perfect for sunbathing or relaxing under the almond trees. The cabaret table offers a cozy spot with a partial ocean view. On the opposite side of the flat, a second terrace overlooks the beautiful fountain in Plaza Carlota and boasts a solid Guanacaste live-edge dining table that seats eight. With three sets of arched doors opening to each terrace, the living area offers delightful breezes, natural light and quick access to the outdoors. Between the two terraces are the open kitchen and living room. The spacious island in the fully-equipped kitchen allows for a casual dining or entertainment experience with your friends or family. The living area has seating for six for evenings of games or TV watching. A sofa/trundle bed in the living room provides comfortable sleeping space for two. With a half-bath off the living room, a shower in the foyer, and a door at the hallway, this area can become a private retreat for two guests. Down the hall are the laundry room and two bedrooms. 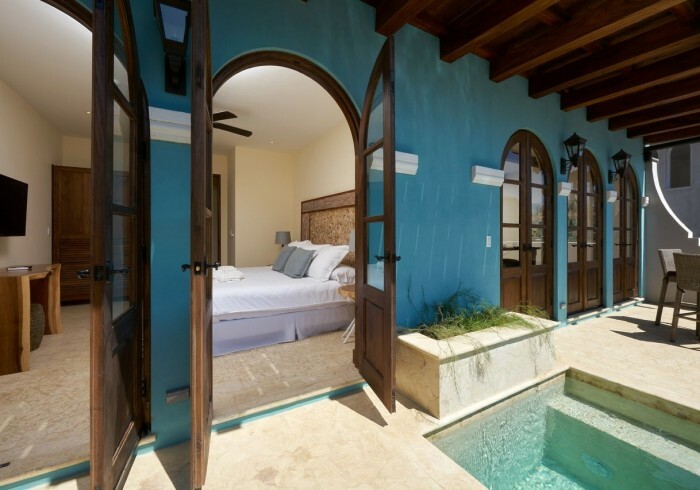 Each bedroom has a full bath, smart TV, ceiling fan, AC.and two sets of doors leading out to the pool terrace. The master bedroom has a king bed. The guest bedroom can be arranged with a king or two twin beds. The flat is strategically located within minutes of the beach , the Beach Club, hiking and biking trails, and the conveniences offered at Plaza Central.